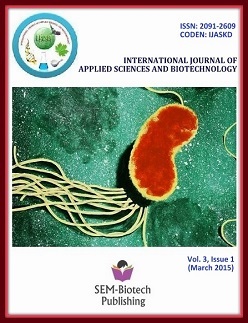 The aim of this work was to investigate the effects of different culture conditions on the production of poly methyl galacturonase enzyme bySclerotium rolfsii and their optimization. Activity of poly methyl galacturonase enzyme was assayed by viscometric method. Culture conditionslike culture media, incubation period, temperature and pH greatly influenced the production of poly methyl galacturonase enzyme. Out of tenculture media, only six media were proved to be producer of poly methyl galacturonase enzyme. Amongst them, Elliot’s medium was foundto be the best for the maximum production of poly methyl galacturonase enzyme. Analyzing the different incubation period, the production ofpoly methyl galacturonase enzyme was found rapid (3 days incubation) in Sclerotium rolfsii. Whereas, production of poly methyl galacturonaseenzyme, gradually increased with increasing the length of incubation period up to 18 days and further increase in length of incubation up to 10days, did not show any effect on the production of poly methyl galacturonase. The nine days incubation has found to be the best incubationperiod for the maximum production of poly methyl galacturonase enzyme. The Sclerotium rolfsii was also able to produce the poly methylgalacturonase enzyme at wide range of temperatures (from 15ºC to 35ºC), but 30ºC temperature was found to be the best suitable for themaximum production of poly methyl galacturonase enzyme. Among the wide range of pH tested (pH 3.0 to 9.0), the pH 5.0 was proved to bethe best for the maximum production of poly methyl galacturonase enzyme in Sclerotium rolfsii when it was cultured in the same medium. Onthe basis of overall experimental results it could be concluded that Sclerotium rolfsii has potential to produce poly methyl galacturonase enzymeconstitutively.